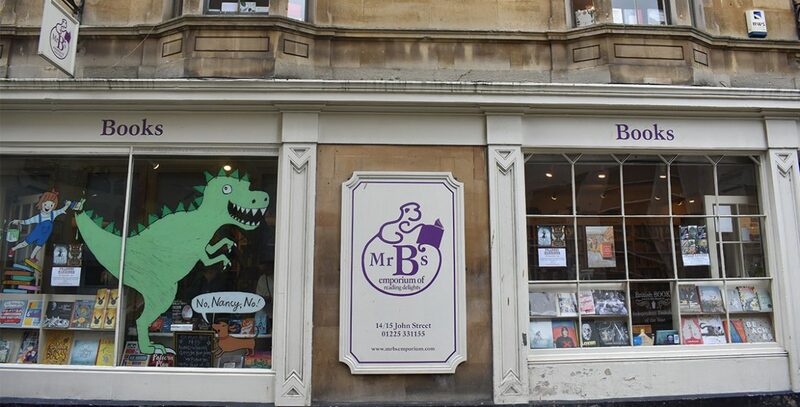 Since it opened its doors in June 2006, Mr. B’s Emporium of Reading Delights in Bath has become famous amongst lovers of indie bookstores for its decor and its innovative book recommendation products and reading gifts. We’d learned of their Reading Spas and Reading Subscriptions whilst researching our bibliotherapy article of last month and were intrigued. We knew the store had won a number of awards, including twice winning the coveted ‘UK and Ireland Independent Bookshop of the Year’ award, so we called up the co-founders, Nic and Juliette Bottomley, and asked them to tell us more, particularly about their innovative Reading Spa gift. Nic kindly walked us through the Reading Spa and explained how and why it has proved such a great success. Firstly, can you just explain to us, what exactly is a ‘Reading Spa’? Yes of course, the Reading Spa is a ninety-minute consultation which takes place in Mr. B’s very own bibliotherapy room. It is often given as a gift from one person to another. In the bibliotherapy room, customers meet with a member of the Mr. B’s team for an informal chat about their favourite genres and book preferences. At the end of the session customers are presented with book recommendations tailored to their individual reading tastes. Included in this £80 service is a £55 book voucher to spend on the recommendations, a Mr. B’s cloth bag, mug, and £5 gift card for their next visit. We were lucky enough to see a live Reading Spa take place in Mr. B’s main bibliotherapy room! Where did you get the idea for the Reading Spas? When we had been open about eighteen months we went to the pub at the end of the day. We were talking about the fact that the shop was going very well and people loved the space and they loved everything about the service. But the thing that people seemed to really like, and this was very accidental, was the recommendations. It wasn’t just the service, which we had always focused on, but that we were always on the shop floor and wanted to give recommendation after recommendation, because we like talking about books. So, then we thought about how we could turn that into a gift. How many do you do a day? We have a fixed number of bookings a day. We don’t normally do more than four per day just because of the time it takes to create the right experience. They all take place in our bibliotherapy room on the shop floor and we don’t want them tripping over each other. That being said we did do six today just because some people were coming from far away but on average we do four every day which is why it’s important to book ahead. What sort of customers receive Reading Spa gifts? The majority are what you would call heavy book consumers. Although, I did have one chap who had only ever read six books and wasn’t sure why he’d been bought the gift but he went away very excited with another six books so that worked really well. But generally speaking I wouldn’t say there’s a common age, the youngest I’ve ever done a Reading Spa for was a very chatty four and half year old. I’ve also done them with people in their eighties so it’s a very broad range. Do people buy the Reading Spas for themselves? There are people who buy them for themselves but the vast majority is gifted. Reading Subscriptions, which are mystery books we individually select for each subscriber and mail out each month, are a little more for themselves or they’re gifts and then people renew them. When you do the recommendations in the Reading Spa do you have to go away and think about them or are you able to suggest titles right away? So that will vary depending on which of us is doing the Reading Spa. For me, only because I’ve been doing them a long time, I decide as people are speaking to me. I don’t write down what people say to me anymore, I just write down the books I’m going to bring them. Now, obviously, it’s all within a scale of things. Sometimes you’ll come across a customer where it’s a lot more difficult to get the trigger, if people are interested in a more niche area you might need to um-and-ah a bit more. As a rule, we try to show people in a Reading Spa on average fifteen to twenty books for them to choose from. I would say I usually know what twelve to fifteen of those are by the time I go to find the books. How many books do people purchase with the £55 book voucher? On average, the voucher covers about six paperbacks but people can purchase above and beyond that and many of them do. We try to focus on paperbacks in the Reading Spa because we’re conscious that people want to make the most of their voucher. So we always show, more or less, fifteen books so they have a good choice and then we write down all the other ones for the future. Do you ever cater to any book clubs or groups with your reading gifts? I’ve done Readings Spas to audiences of a couple of hundred people and that’s pretty good fun. We have also done Reading Spas for larger groups but I must say that the Reading Spa itself doesn’t really work for a book club because it’s an extremely time intensive thing. However, we do spend a lot of time talking to book clubs and recommending books for them. We have six book groups of our own. I’ve also done quite a bit of training for librarians, especially on how to proactively talk with people about books. Teams in libraries are stretched every which way nowadays because they’re asked to do much more than just look after books so we’ve done some training for them. I came across mention of a reading booth, is that the same as the bibliotherapy room? No, the reading booth no longer exists, just because it’s always good to change things up. But the reading booth was a quirky booth-sized room with a leather chair and a drink stand. It was in the bibliotherapy room and you could go in and ‘try on your books’ – if you like. We removed it when we built a second Reading Spa room which is like a lovely conservatory with black and white harlequin floors. So now we have the main bibliotherapy room and then we have this little side room which is almost like a garden room, it looks out onto the roof. I want people to spend time in my shop. I absolutely think that the larger retailers’ view that they should have people in and out within a certain time in order to generates purchases is wrong. In my experience, the longer you allow people to treat your shop as their home-from-home then when they’re in the mood or financial state to buy books then you’re the place they’ll come to. Even with that in mind, the shop doesn’t get used in a library kind of way. Although when people are browsing for books there are plenty of places for them to sit and consider them. Some retailers think that if you put out comfy chairs and stuff like that then people will abuse your hospitality. In my experience that simply doesn’t happen. For me it means pleasure more than information or knowledge. Although I suspect a lot of people would also add knowledge. On a personal level, I like a book that takes you to a different place or time, that gives you an insight into something or opens up different views about the world and new perspectives of people and cultures. What I see from the Reading Spas is that there are so many things reading can do. People read for escape, self-improvement, they read for companionship. There are all sorts of different things people turn to reading for. I recently did a Reading Spa with a young lady who had been reading very much in one area but she wanted help exploring a list she’d made of new books she might like. It doesn’t always work like this in a Reading Spa, often people are very clear on what they like and want to keep reading a certain style. Do you find that your consultations generally focus on the purpose of reading for entertainment or do people use the Reading Spas to find books that will help them overcome something in their lives? We never ask about personal lives unless we’re invited to. There are people who take bibliotherapy down that route and have a psychological angle and an insight into which book goes well with a given problem. We specifically focus away from that. If I’m asked to do that on the shop floor or in a Reading Spa then I will of course have a go at it and give an opinion but that’s not what our Reading Spas are about. Our Reading Spas are about finding people a book they’re really going to enjoy. Now, enjoy is as broad as you like. Plenty of people enjoy brutal horror or literary memoirs, it doesn’t have to be upbeat, whatever you like we will find you a book you’ll enjoy. We have no training in counselling or therapy in that sense, our bibliotherapy is about lifting people’s spirits by finding them great books they’re going to enjoy. Whether their spirits are already lifted or if they need a lift it doesn’t make any difference. Well, that’s all the questions I had. Did you have anything else you wanted to share? We just did the first ever book shop at Glastonbury festival, so there was that going on. We are launching a new website in the very early autumn! Our current website is lovely and was very innovative and creative by independent bookshop standards when it launched, but that was back in 2011. So, we’ve decided it’s time for a new one. It’s going to reemphasise, again, the idea of us as a place to discover books and recommend books, that’s really going to be a focal point of the website. So that’s coming soon! Alongside their Reading Spas, Mr. B’s also offers Reading Subscriptions. This starts with either an online questionnaire or a fifteen-minute consultation in-person or over the phone. Customers then receive an individually selected, beautifully wrapped mystery book each month. Price varies depending on the subscription length. More recently Mr. B’s has started selling Reading Bundles. These are a five unknown, surprise books chosen around a specific theme costing £65. They are distinctively wrapped and boxed with tasting notes to explain why they were handpicked by the Mr. B’s team. With these postage gifts Mr. B’s has extended their reach to international customers. Various other bookstores offer similar subscription and themed book packages as these are a great way to combat the often local limitations of independent bookstores. However, Mr. B’s is best known for their Reading Spa gift, inspired by their reputation for excellent recommendations. It’s no wonder they’ve developed such a strong brand! If you’re interested in reading for therapeutic purposes learn more about bibliotherapy here!